Every parenting book. Every doctor. Every teacher. They all have the same advice: READ WITH YOUR KIDS EVERYDAY. Yet… no matter how many times they tell me, I still see days where I tuck those tired, little bodies into bed without a book in sight. We all do it! This is real life. It is a challenge to find time EVERY day to get your kids in a book with you. Today, Delicious Readers, I am asking you to accept that challenge. Read everyday. 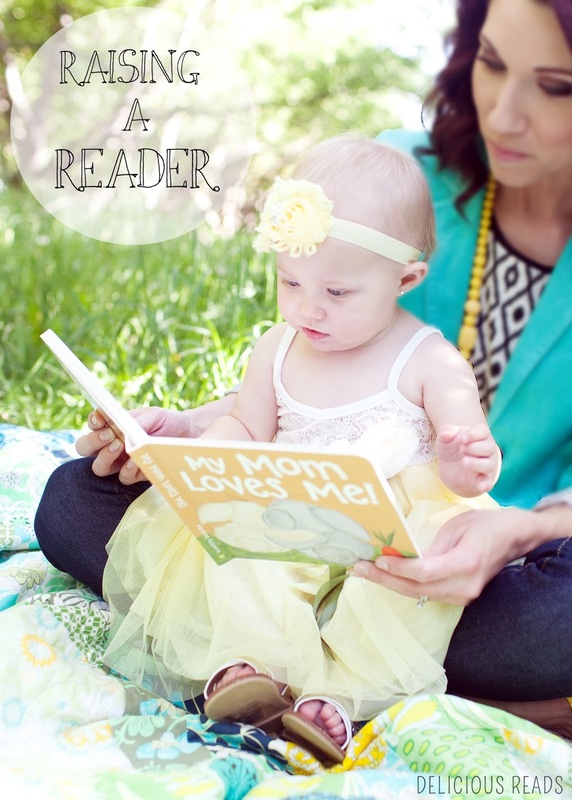 More than ever, our littles need reading time with their parents or siblings. Tablets, Netflix, video games… none of these come CLOSE to matching the benefits of a few minutes of reading with your child. Let’s chat more about those benefits for a moment, shall we? * Reading time is bonding time. A cozy, focused moment in the middle of a distracted day. * Reading allows kids to problem solve, anticipate emotions, develop reasoning skills, and empathize. * Reading requires kids to see, taste, smell, hear, and feel things in their minds. It flexes their imagination muscles. * Reading introduces kids to science, history, geography, art, and people. Now let’s chat the downsides to reading, shall we? *There are NONE! This was a trick. I remember settling down every day to read little board books with my 6-month-old baby. She was my first and I was determined to make sure she loved reading as much as I did. I would get cozy, hold her tight, and softly read through the pages. Oh, I loved those moments! So enjoyable. So fulfilling. So… quiet. Fast forward a few years and those cozy moments have been replaced with frantic days of bouncing a newborn while chasing a toddler while negotiating with my oldest to PUT THE SCISSORS DOWN. Finding reading time for me these days has been rough. I say we will do it before bed…. but then we are out late and they are all asleep in the car. I say we will do it before naps… but I have laundry mildewing in the washer. I say we will do it in the afternoon… but I have locked myself in the bathroom with a snickers bar and a Diet Dr. Pepper to stay sane. I’ve got excuses for days. I am putting these into practice this next month and I want to hear how you are doing in your own efforts! Keep me posted on how it is going and be sure to let me in on YOUR ideas to get reading everyday! See you next time when we will be chatting audiobooks for your littles! 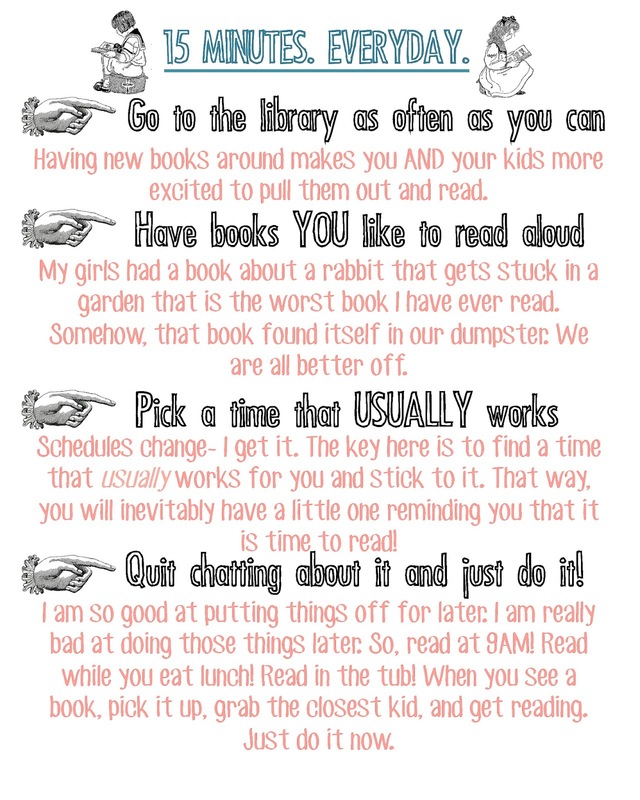 This really has remotivated me to make reading a priority with my kids. I'm going to really work on it because I would love for my kids to love reading as much as I do. We read before quiet time and before bed, it is a great routine for us.